The first publication of a manuscript peirush on sefer Bereishis from Rabbeinu Yitzchak bar Rav Yosef (the Rivi). The explanation of the Rivi is a fascinating explanation of the Torah written by an acquaintance of the Rashba. He was also a Rebbe of Rabbi Yitzchak d'min Acco (Rabbi Isaac of Acre), the author of Me'iras Eynayim. Aside from the Rivi's unique interpretations, the sefer is invaluable for the Rivi brings new insights he himself heard from the Rashba. These insights were not published anywhere else. Additionally, the Rivi quotes previously unkown insights from the manuscripts of Rabbeinu Chananel's explanation on Chumash, as well as Rav Shmuel Ben Chafni Gaon's peirush on Chumash. The sefer is beautifully elucidated, and the numerous footnotes contain a plethora of sources on numerous topics. 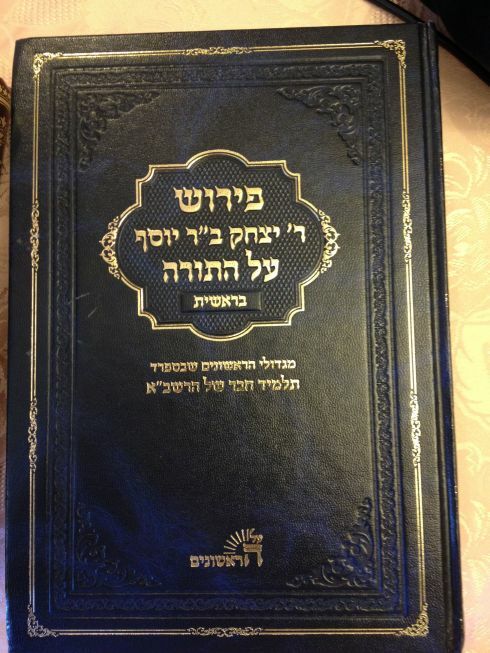 The Sefer contains Haskamos from the Rivivos Ephraim as well as Rabbi Yochanan Zweig and Rabbi Yehuda Krauss. 359 pages, including a 40-page intro. Hard-cover. All Hebrew.